We own two other houses downtown: the Treehouse, a three-bedroom vacation rental that sleeps 10 (vrbo #312061) and the Durango Hideout that sleeps 10 in 4 bedrooms (vrbo# 1150651). The Carriage house has 3 bedrooms, which are all located upstairs. The master has its own spacious bathroom and a king bed. A second bedroom has a queen bed. Then there is a third bedroom that has a queen along with a twin in a loft of this room. The entire second floor has gorgeous vaulted timber ceilings. Downstairs, there is a full bathroom, a great room, and the kitchen, which has bar seating, stainless steel appliances, and concrete counter tops. Outside, there is a front porch and a back patio, which is equipped with a grill and seating. Inside, the on-demand hot water system ensure you will always have plenty of hot water. The house is now equipped AC. We put individual units in the bedrooms and one in the living space so it will be plenty cool. This house is a legal and permitted vacation rental so there will be no troubles with your stay (project #2012-65, permit #12-033). 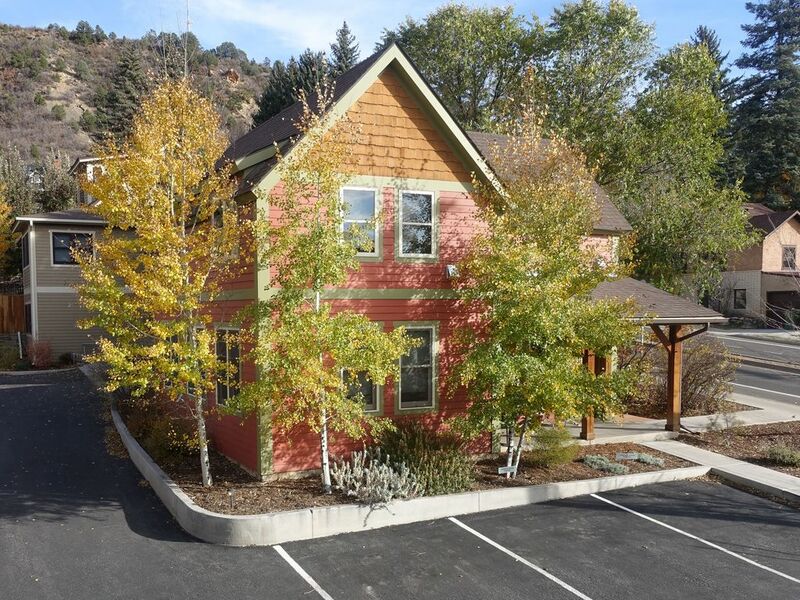 This is the perfect spot to enjoy the Durango lifestyle, as you are in a busy neighborhood within minutes of restaurants, shops, the bike path, the Animas River, and city parks. Sit on the front porch and watch the Durango-Silverton Narrow Gauge Train rumble right by the house, or take a stroll on the river path that’s just a minute away. LOCATION: Conveniently located downtown at 1503 B E 3rd ave. Individual units in all bedrooms and living room. A pack'nplay is under one of the beds and a high chair is in the downstairs closet. Nice, clean house in a perfect location. It was great to park the car and leave it for the long weekend - everything was walkable. We had a good stay here. 3 adults, 2 kids. Nice location. Close to town but not right off the main avenue. The only thing (and it’s quite minor) is that I wish the house had a reclining bin. We tried to take our recyclables to the center but it was closed on a Sunday. Other than that, we had an easy & comfortable stay. Thanks! Close to town and the river. Andrew is awesome to work with. Have stayed two separate times and will stay again when in Durango. Five of us came in from Kansas City for a week. We felt we were centrally located as we visited Pergatory and Telluride. Several good eateries and super friendly locals. We loved the house: plenty of room, great to have washer/dryer, roomy and clean! This property was the perfect home for our Durange trip! Our family, including two teen daughters and a 5 y/o son, LOVED this house. The location was perfect, around the corner from Rotary Park and the Animas River trail, as well as a few blocks from downtown Durango and several restaurants and breweries. The interior of the house was beautiful with the exposed beams and modern bathroom tile. The three bedrooms were large, clean, and very well decorated. The kitchen was stocked with anything you could need to cook a large meal, including a crockpot (which was perfect to have soup waiting for us after a cold day in the snow). The bathrooms were stocked with shampoo, conditioner, soap, etc., clean and beautiful. We'll definitely look here first for our next trip to Durango. Fantastic property located steps away from Main Street! Wonderful home and beautiful layout. Easy drive to anywhere you want to go in Durango or Purgatory. We’ll definitely be back. My family loved the organic shampoo and conditioner so much my husband ordered 6 bottles to be delivered by the time we arrive home. :) Thank you for a wonderful stay!